This is an easy to assemble toy car made using lots of high-tech tools. Once you 3D print, and laser cut your parts, the rest can be zip tied and bolted together in minutes. I was initially planning on making more of a hot rod. However, thanks to the slow speed of the servos, it turned out to be more of a cruiser. This vehicle has a slow smooth ride, which makes it the perfect motorized platform for all kinds of applications. For instance, it makes a great camera dolly (for silent films and music videos), and a suitable robot base. Nonetheless, it was a fun exercise in state-of-the-art personal fabrication. Sanding and staining will ensure your cruiser's frame is more durable and has a longer lifespan. Sand both sides of your wooden bracket and wipe them off. Coat one side with wood stain. Wait for it to dry, sand it lightly, and then coat it again. When the first side is dry, repeat on the opposite side. Grab one of the servo motors. Widen the outermost hole in each corner of the servo's horn with a 1/8" drill bit. Repeat on the other servo. Zip the wheels to the servo horn using 4" zip ties. Press fit the 1/4" rod firmly into the wheel's hub. Center the wheel upon the rod. Place the pivots onto each end of the metal rod. Slip the wheel into front fork of the laser cut bracket and zip tie the pivots firmly in place. Zip tie both of the servo motors firmly to the back end of the laser cut bracket. Make sure the servos are on the same side of the bracket as the pivots. Place the battery holder on the same side of the servo bracket that the servos and pivots are zip tied to. Line up its mounting holes with holes in the bracket and fasten it in place with the 4-40 nuts, bolts and washers. 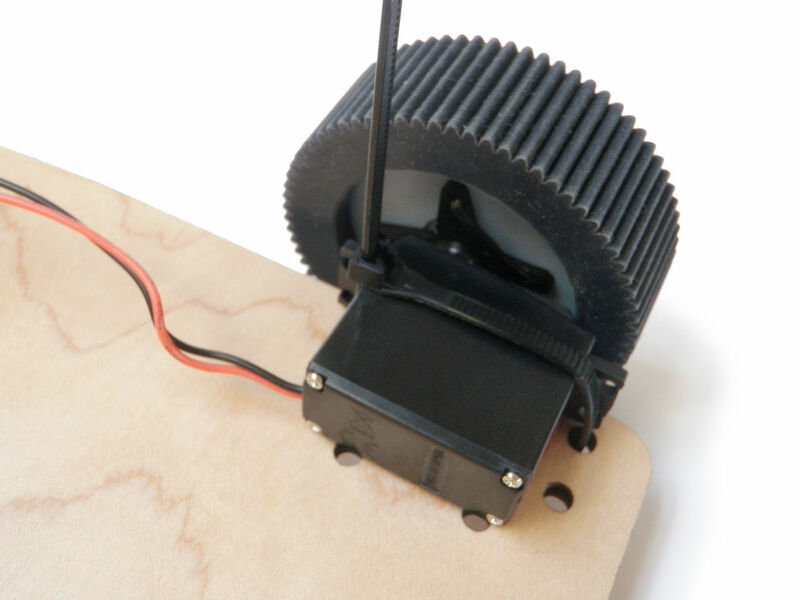 Turn the servo bracket such that the servos are closest to you. Twist together the red wire from the servo on the left to the black wire of the servo on the right. Connect both of these to the red wire from the battery holder. Twist together the black wire from the servo on the left to the red wire of the servo on the right. Connect both of these to the black wire from the battery holder. Solder both pairs of wire together to make a more reliable electrical connection. Zip tie all of the loose wires together such that they cannot get caught on anything and the exposed electrical connections can never touch each other. Insert batteries, flip it over, and watch it go. Feel free to use it however you wish. I stuck this micro tripod on topn and used it as a camera dolly. It was a lot of fun. I think it will work well as a generic robot base as well. If you enlarge this project could it become a motorized skateboard? If so do you think it would have a chance of holding a 90 lbs child?. This is very similar to my things but my one has two wheels at the front one at the back like the Morrigan. DO you have any other cars like this and does that car have a switch. would you mind if i copied this idea for a normal base for a fighting bot??? Go for it. Let me know how it works out for you. It looks pretty useful. Lets see some simple bots based off this platform! does it even matter if it flips? Cool project, but from the looks of that video, it is pulling to the left pretty good. Might want to have the front wheel some how a little adjustable to fix that. You could also then set it to slightly turn left or right if you wanted to that way.